HAHAHA your kids are just too funny!!!! Awesome "ball on head" pic - you're right; the "pros" would not have taken that picture. 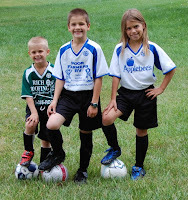 We did our own soccer picture, too. And it turned out really nice.